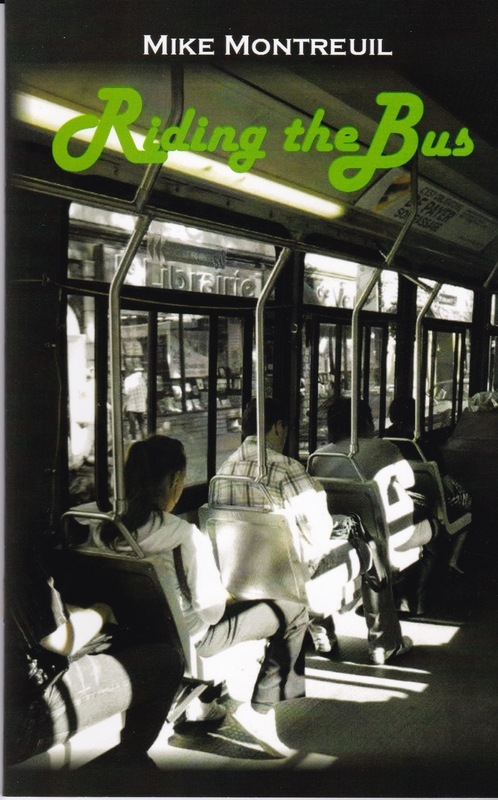 Riding the Bus, by Mike Montreuil (2011, Bondi Studios) When Mike Montreuil took the bus every day to work in Ottawa, he was often thinking poetry, looking at his world through a haiku poet’s eyes. Contrary to supposed tradition, his haiku often had no season word from nature. There were not too many dandelions growing in the aisle. He had to look elsewhere. At first it seems no more than a casual observation seen from the bus window. Except, yes, there are possible season words here: skateboards can be used in three seasons, and daycare is open all year round. So, season word of a kind. What I like is the scene of young children with a father who is not all that much older than they are. You can almost hear a conversation. What might they be talking about, and why is the father not at work. If he isn’t working, why isn’t he taking care of the children. There are a thousand ‘ifs’ and ‘mights’ in the scene, but that’s what is intriguing about it. Mike has told many stories in a few clear words. No season word, and a few seconds only of seeing the two women. The poem in context of 2011 is poignant. New laws, the media and social media slant the scene.It’s a tender moment. There isn’t much time at a city intersection to kiss, but they’ve seized the moment. It’s tender too as we know nothing of the two women. They could be sisters or mother and daughter, or friends. I like the open-endedness of the haiku. There is a lot left up to the reader. While most readers will think ‘lovers’, many would disagree. One thing is evident: the scene is not, in 2011, considered outrageous. And Mike may have been the only person to have even noticed them. Tiny details usually pass unnoticed. As an overly sensitive teenager, I used to worry about what other passengers on the bus thought of my appearance. Of course, probably nobody even noticed me. This haiku offers atmosphere, a fuzziness perhaps. The morning light is so soft, or, equally, overly harsh. We on the bus are not even fully awake. It’s as if in trying to wake fully, the poet just happens to notice someone’s hair, and before his gaze moves on, that one little thing sticks in his consciousness: split ends. Family experience tells him that women are not happy if their hair has split ends. This is where the poem opens up. Whose hair. Why split ends. What is this woman’s life like. Does she care about her hair. What connections is the poet making. Or is the poem simple observation, like looking at a photograph or painting, possibly in a half doze. The difference here is the attention given to the experience. In the ‘skirt’ and its stretched seams, sketched in nine words, the poem suggests a national weariness with winter, as well as a glimpse of the wearer, someone who, perhaps, has had to buy an inexpensive skirt, or one that does not fit as well as it could. This chapbook collection, with its perfect photograph on the cover by Carole Daoust of Montreal, tells writers not to let the moment pass. There can be a world in a few seconds, whether in split ends, in a glimpse of a skateboarder or through a truck window. It’s as if William Blake were on the bus. Thank you Mike, for this view of the city. I enjoyed entering Mike Montreuil’s world for a moment, seeing through his eyes morning sunlight in split ends, for instance. Thank you!